An ex-cop Vikram Rana is all set for his new venture. A new case is waiting for him which can make him reach the zenith. There is a murder in town, that too in the family of his old buddy Rohan Lohia. Vikram gear up and talks to everybody who is a little bit related to the murder of Mrs. Richa Lohia, wife of Rohan’s elder brother Gaurav Lohia. Another interesting case “The Sonia Sinha case” Vikram gets after solving the previous murder mystery. Two business partners, various murders and a handful of suspects. Well it is a detective novel and what better than making it clear from the name itself. 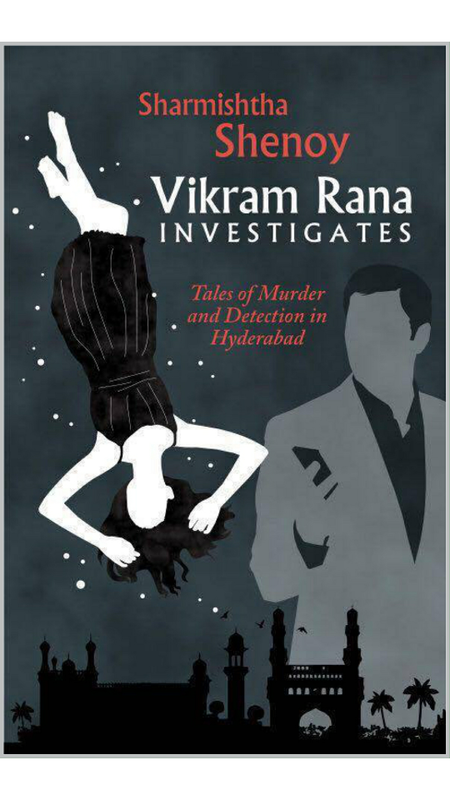 “Vikram Rana Investigates” is a well suited name for the book. And the cover too is as ravishing as the name of the book. The dark and mysterious background with two person with no faces work well with the murder mystery, which is about to be displayed in the book. Also I loved the showcasing of Hydrebad city in the lower portion of the cover. It seems the author has taken care to show even the parts from the subtitle to make it a complete picture. Murder mysteries has a lot of suspects and victims, the cases in the book has the hue of same order. There were a lot of characters related directly or indirectly with the case. And it was nice to see that the author had brought them in front from time to time. It made the show look really realistic and understandable. From the major characters I liked Vikram Rana of course. He was not the tough guy with extra embellishments. He was shown with utmost care and precision. From the first case I liked Gaurav Lohia and Rohan Lohia and from the second case I liked Pavel. From the minor characters I liked Veena, Lakshmi, Juhi, Kinshuk etc. I liked the way the author presented the cases. The narration was smooth. Chapters were divided well and also named well. Vikram Rana Investigates was my first Indian detective novel. I was highly impressed by the writing style and the two stories that were shown in the book. They seemed very well thought of and not at a single place I felt that I know who the murderer is. From the very start the author had tried to build up the suspense of high order. What I liked the most in the book is the way of showcasing the case, step by step. Also I liked the transitions in the characters which came in front after each revelation. This was a very nice move. If the author had explained everything in advance then such effect wouldn’t have been created for sure. Coming back to the story, well I thought that the author shouldn’t have summarized the advancements again and again. It made me skip some paragraphs easily without missing much. If a person skips some part of the chapters and read the endings then one can easily decode the things. The first case was far better than the second one because I felt that things were a little more complicated in the second case or maybe the author didn’t present them well. The pictures became quite hazy in between and I had to re-read the incidents or check back who was whom. I liked the little gags which were presented in the form of difference in opinion between Veena and Vikram Rana. I loved how Vikram always had a back door to all the issues he was facing due to his wife. Summing up- The book came out to be a lot better then what I expected. The hopes were high from the first chapter itself. Mysteries were highly refined and interesting. Waiting to read more in the same series. • The smooth movements of the story. • Creation of a perfect mystery. • Not even a single part of the story was able to mark an extra-ordinary impact. Things just moved and moved and ended. The book was suspenseful and the mystery was nicely folded and unfolded. Any thriller lover can give it a try. Sharmishtha Shenoy loves writing murder mysteries, the kind of books that she herself likes to read. Her favourite authors are Sir Arthur Conan Doyle and Agatha Christie. She also likes the work of Satyajit Ray- especially the Feluda Series. She was born in Calcutta and has done her post-graduation from University of Reading, Great Britain. She lives in Hyderabad.